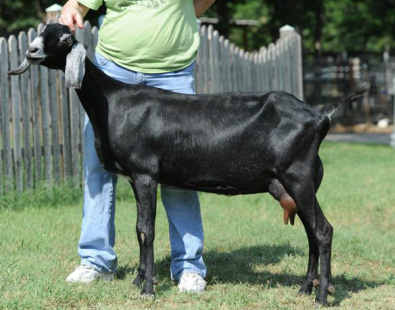 This Jackpot daughter is out of one of our favorite girls "Oprah" and has her same long body. With this AI breeding to CH *B Lakeshore Farms Hit The Jackpot (LA91 EEE) we were hoping to add length of bone and height, and we certainly got that !. She is definitely LONG and TALL, (guess we should have named her "Sally"!). Her name comes from the Frank Sinatra song...hence the nickname "Frankie". Her brother, Chance, is already 'working' hard in our herd ! Frankie half sister is GCH Blissberry J Alibi (LA92 EEEE) was ADGA's number one nubian milker in 2011, and we are seeing some of the same will to milk in Frankie. She is by far out milking all of our other first fresheners and will easily surpass 2000 pounds in 305 days as a first freshener. 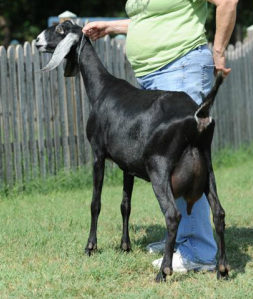 She was bred to a Royal Marcus son, Royal Sherman, for 2012 kids and produced 2 does. Coco Chanel is staying at Latte Da and her sister Chocolat Chanel has gone to a show home that we are very exited about. We are already seeing her 'broaden out" as she goes through this lactation. SHe has been on extended lactation and has produced very well ! Frankie will be bred again this fall for 2014 kids. Check out our planned breeding page for more information.